Moxie is a lovely 2 year old pit bull who pulls, pulls, pulls. She has places to go! After the first couple of walks in the neighbourhood to test the dog, I decided it was time to test the new-to-me leash. This particular leash is made of semi-rigid rope (I’m sure there’s a technical name for it, but I don’t know what it is) that holds it’s shape somewhat, which I really like. This prevents it from drooping too much and getting tangled in legs, either mine or the dog’s. 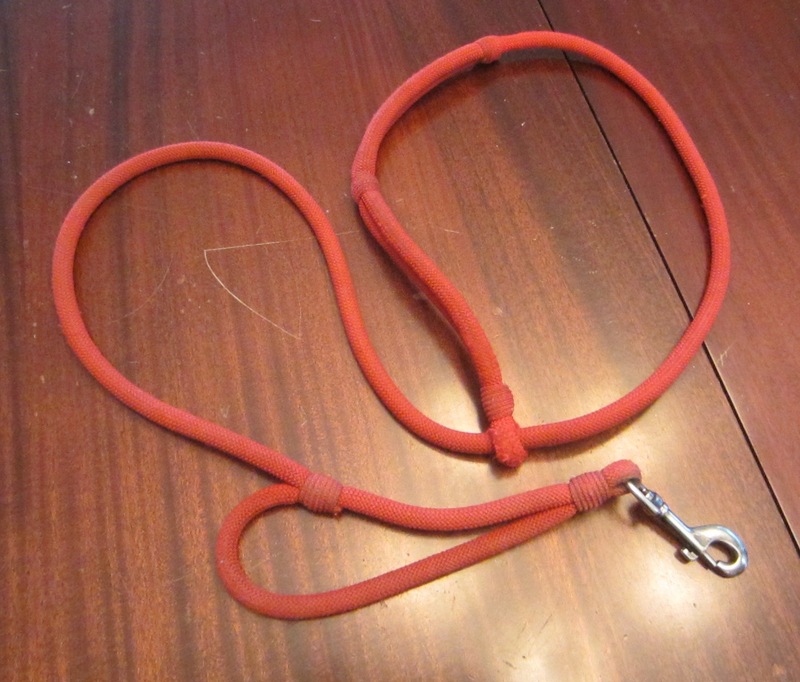 It also has a hand loop near the collar end, which would come in handy if you wanted your dog closer for a few strides. 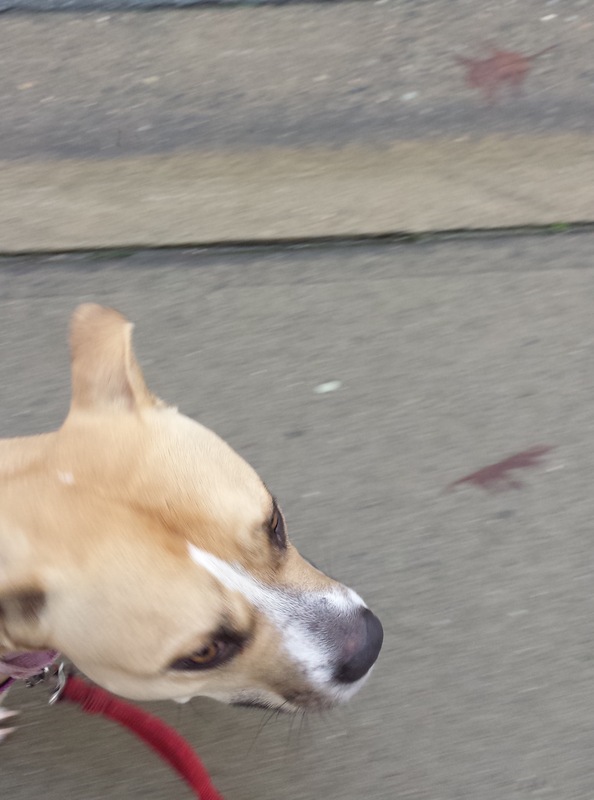 In terms of teaching Moxie to heel, the hands free leash is especially helpful because there is no give when I stop. With a regular leash your body may stop but your hands typically continue moving forward, giving the dog more play on the end of the line than you intend. 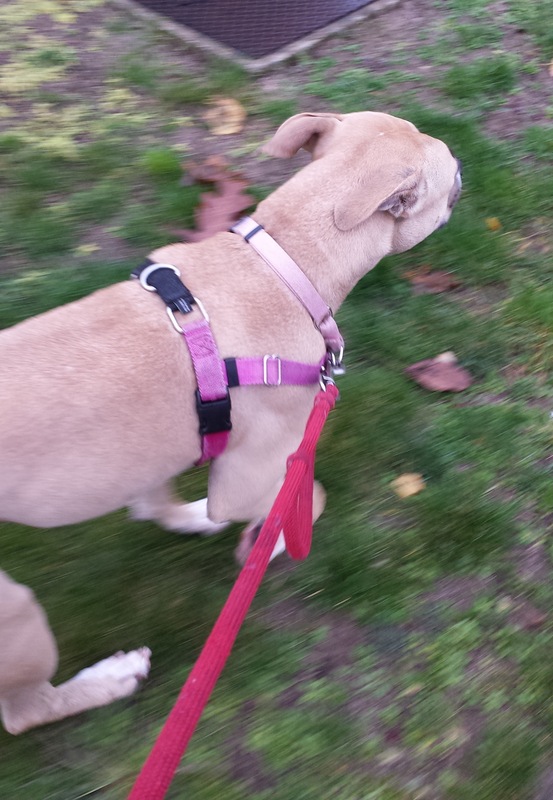 Using a leash connected to my hips means when my body stops, the dog stops which gives a much clearer signal to the dog. And it’s working. Moxie is a quick study, we’re making pretty good progress already. We are starting out our walks on a slack leash vs. pulling from the get-go and she’s doing much better at releasing to the pressure of the lead rather than digging her heels in when something is interesting over there. Or over there. Or back there. When there are really exciting things going on, i.e. other dogs, kids playing and shouting, people coming or going, she has less ability to focus on me, but that’s more an issue of regaining her attention than simply a pulling challenge. All in all, I’m very pleased with the hands-free leash and may even start using it with some dog walking clients.